Commission (g. by Zabeel). 3 wins from 1400m to 1600m, A$99,785, ATC Tenpin City H., 2d ATC Schweppes H., Egroup Security H., Liverpool City Council H., 3d ATC Patinack Farm Supporting 4tracks4kids H.
Tellem Ya Dreamin' (g. by Pins). Winner at 1400m, 2d WATC Playeronline.com.au H.
HOWMUCHYACHARGING (Howbaddouwantit). 2 wins. See above. Belle du Sud. Winner at 1600m in 2016-17, 2d ATC Casino Prince at Vinery H.
Big Profit. 5 wins from 1200m to 1600m, HK$5,340,625, HKJC HK International Sale November Challenge H., Hong Kong International Sale December Challenge S., Swaine Cup H., Humphrey H., Elizabeth Arden H., 2d HKJC River Verdon H., 3d Hong Kong International Sale March Challenge H., HKJC Chow Tai Fook Australian Colours Collection H., Perfect Match Collection H., Causeway Bay H.
You Want Suma Dis. 2 wins at 1400m, 1600m, 3d WATC Westspeed H., 15 Years of Perth Glory H.
ROCK YOU (Oregon). 7 wins-2 at 2-to 1200m, A$459,650, VRC Rupert Steele S., Gr.3, Kensington S., L, VATC GH Davey H., New Gleam H., VRC Emerald Hotel H., Sovereign H., 2d VATC Oakleigh P., Gr.1-twice, VRC Salinger S., Gr.1, MVRC Norman Carlyon S., Gr.2, VRC Bobbie Lewis H., Gr.3-twice, VATC Zeditave S., L, VRC Aurie's Star H., 3d VRC Hilton on the Park Sprint H., L, 4th AJC Galaxy H., Gr.1, VATC Bletchingly S., Gr.3, VRC Standish H., Gr.3, VATC Vain S., L.
Montaigne Way. 6 wins from 1250m to 2000m, A$97,950, VRC Great Western H., VATC Galleon H., High Caste H., VRC Jolly Old Mac H., 3d MRC Street Cafe H., VRC Gill Kane & Brophy H.
WHATEVERWHENEVER (Choisir). 8 wins to 1400m, A$275,690, MRC Moonga S., Gr.3, BRC Coca-Cola Quality H., Biflex H., Lyndhurst Stud P., Brc.com.au H., 2d BRC Nudgee H., L, Eagle Boys Pizza H., Lyndhurst Stud H., 3d BRC Channel Seven H., Glenlogan Park P., St Vincent's Brisbane H., Novotel Brisbane Airport H., Brc.com.au H.
Gay Rosemarie. 2 wins-1 at 2-at 1000m, 1800m in Aust. and New Caledonia, AJC George Bass H., 2d STC Elizabeth Farm H., 3d AJC 3YO Fillies H., STC Nelson Parkhill H.
Athena (Nom du Jeu). 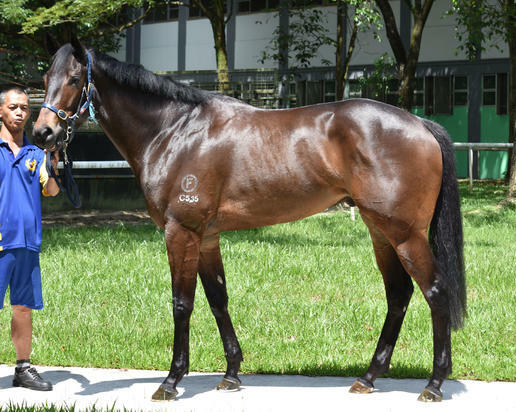 2 wins at 1400m in 2017, Singapore TC Class 4 H., 2d Singapore TC IRT Juvenile S., Class 4 H., Stepitup S., 3d Singapore TC Aushorse Golden Horseshoe, L, Initiation P., 4th Singapore TC Juvenile Championship, L.
Race Record: 4 Starts 0-0-0 S$1,890.